Healthcare experts want you to say no to raw cookie dough. 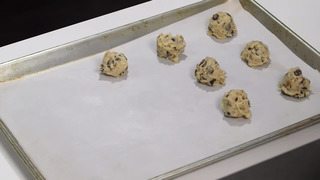 This holiday season, you might find yourself whipping up a batch of cookies in the kitchen, but you may want to think twice before reaching for a taste of the raw dough. The Centers for Disease Control is using this holiday season to remind bakers that eating or tasting unbaked products can make you sick. Flour and raw eggs especially can contain bacteria and salmonella, respectively. So as much as you may want to sneak a taste, it's better for your health to wait until the treats are fully cooked. The CDC as a full list of safe food handling practices here.